An advanced technology designed to allow for much more enjoyable phone conversations. With traditional hearing devices, an annoying, high-pitched whistling sometimes occurs when talking on the phone. However, with the WhistleBlock Technology of the Milo Plus hearing aids, this feedback is completely eliminated, allowing for more comfortable phone calls. This noise-cancelling technology is extremely effective at reducing uncomfortable background noises in the user’s environment. This advanced technology discriminates between background noise, and speech sounds. This allows the hearing device to eliminate unwanted sounds, while allowing the user to focus on what is important. This is a dual-microphone technology that is designed to allow for easier and more comfortable hearing in background noise. It locates disturbing, uncomfortable sounds in the environment, and adapts the user’s hearing aid’s dual microphones accordingly to allow users to focus his or her attention on what they want to, rather than unimportant background noise. This technology allows users to have the most comfortably-fitting hearing device possible, by reducing its occlusion of the user’s ear. 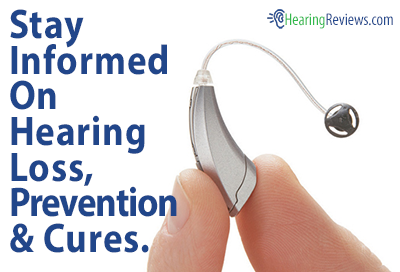 This technology is available in the full range of custom products, as well as BTE hearing aids with SlimTop Soft or cShell, xShell, or SlimTip. 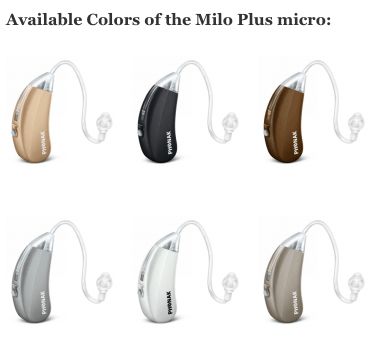 Phonak Milo Plus micro: A micro BTE hearing aid designed for individuals with mild to moderately-severe hearing loss. 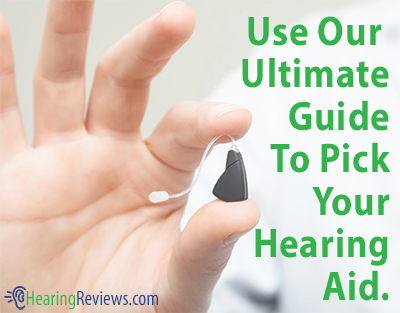 This hearing aid is compatible with a micro tube and dome, SlimTip, or an earhook and earmold. It features directional microphones for better hearing in noise. 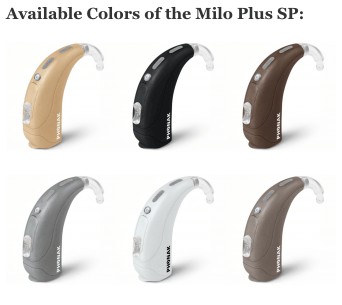 Milo Plus SP (Super Power): A basic high-power BTE hearing device designed for those with moderate to severe hearing loss. It features a robust design, and directional microphones that deliver exceptional in-noise hearing. 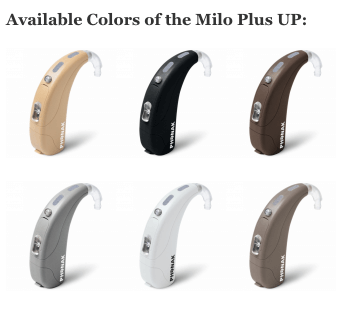 Milo Plus UP (Ultra Power): A BTE high-power hearing aid designed to deliver hearing to those with severe to profound hearing loss. Like the Milo Plus SP, this hearing aid features a robust design and directional microphones for enhanced in-noise hearing. 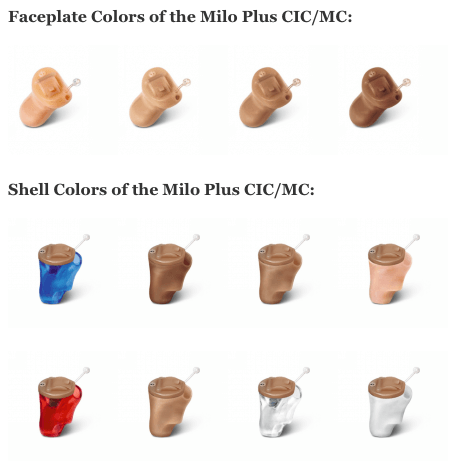 Milo Plus CIC/MC: A Completely-In-The-Canal/Mini-Canal hearing aid designed for individuals with mild to moderate hearing loss. 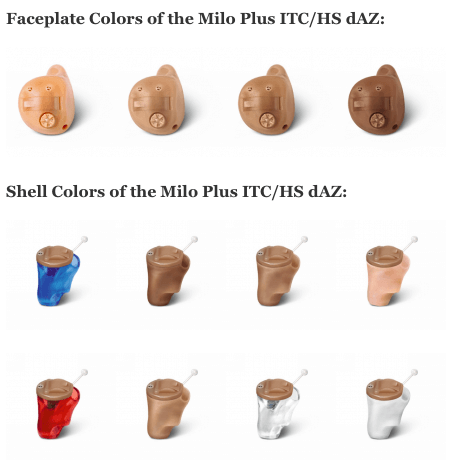 Milo Plus ITC/HS dAZ: An In-The-Canal/Half-Shell hearing aid for individuals with mild to moderate hearing loss. This device features directional microphones that deliver better hearing in noisy environments. 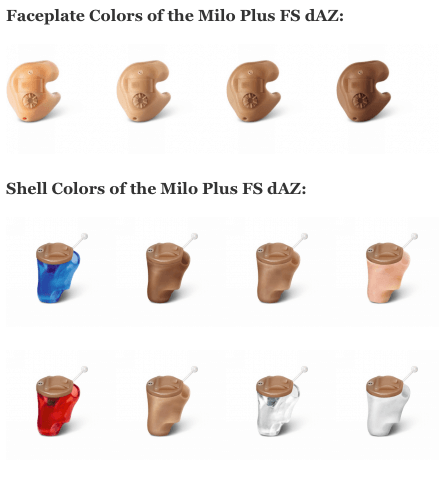 Milo Plus FS dAZ: A Full-Shell hearing device designed for those with mild, up to moderately-severe hearing loss. It features directional microphones to provide users with enhanced hearing in noisy environments. 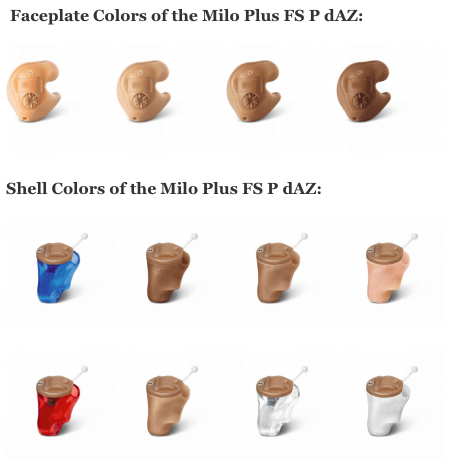 Milo Plus FS P dAZ: A power model Full-Shell hearing aid designed to deliver hearing to individuals with moderate to severe hearing loss. With its directional microphones, this hearing aid is designed to deliver enhanced in-noise hearing to users. inspiro: This Dynamic FM transmitter is equally well-suited to be used in either regular, or special schools. It transmits the voice of the teacher directly to the hearing device of the student (or students), allowing for much easier, clearer hearing. ML11i: This miniature design-integrated Dynamic FM receiver is designed for the Milo Plus SP. It receives audio that has been transmitted from one of Phonak’s FM transmitters, like the inspiro. This isn’t the only model we have, see the other Phonak Hearing Aid. I am a senior citizen music therapist working in long term care homes with dementia patients.